‘What a beautiful country Japan must be’, said my little daughter thoughtfully, as she studied the views on her fan. ‘It has red and white skies, and a mountain blue, it has green and white grass, and pink trees too; Did you know trees were pink in Japan? ‘It has curious people with purple robes, who play with sticks, and toss up red globes, and the women go gathering tea. she said, as she held the fan in her hand; and then thought what Japan must be. Quoted in Annie R. Butler, Stories about Japan. London, the Religious Tract Society, 1888. Until mechanical ventilation and air conditioning became routine, the swaying of a multitude of fans was a constant part of social gatherings, from balls and dances, to theatres and church services. They also had further use as a decorative object in their own right, and became highly collectable. 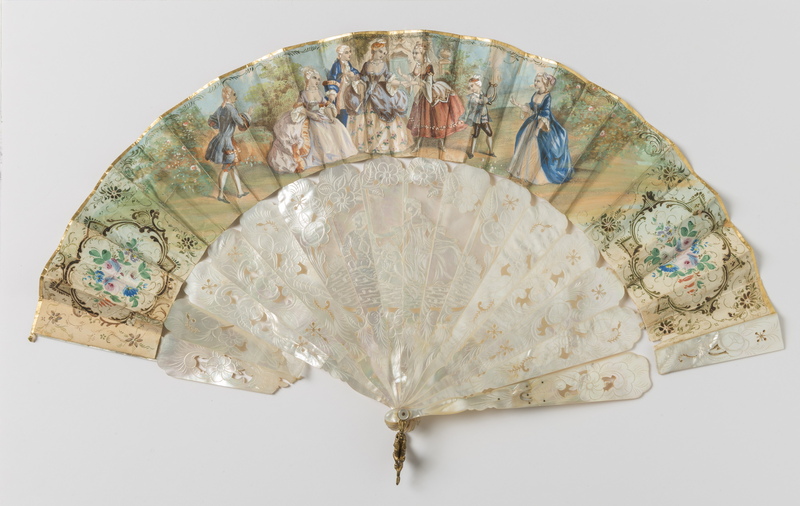 Materials and decoration aside, the elegant deportment of the fan was itself an indicator of social class, giving rise to the complex ‘language of the fan’ in the 18th and 19th centuries where gestures or attitudes using an open or closed fan conveyed meanings. The resurgence of interest in the fan in the later 19th century was given a considerable boost in July, 1878, when a ‘Competitive Exhibition of Fans’ was held at the Drapers Hall, London, by the Worshipful Company of Fan Makers, a body founded by Queen Anne. Along with new examples, fans with a provenance to historical figures including Marie Antoinette and Madame de Pompadour were displayed. As a collectable item their place was set along with other objects of vertu. In her later life Bessie Rouse (nee Buchanan, 1843-1924) displayed her own collection of fans in the sitting room at Rouse Hill House. In the late 1970s many of these prized heirloom fans were still displayed in a glass cabinet in the drawing room. Today they are kept in secure storage for conservation reasons. Bobby Paton (nee Terry) in fancy dress, holding a Japanese fan decorated with flowers and a crane. Photograph Jenni Carter for Caroline Simpson Library & Research Collection, Ian and Miriam Hamilton collection. The fan’s use as a decorative element peaked in the later 19th century. It was an iconic element of the Aesthetic style - alongside blue-and-white ‘willow-pattern’ china and vases of sunflowers. This followed the opening of Japan to the West with the Convention of Kanagawa in 1854, after which Japanese trade goods flowed freely to international markets. Gilbert and Sullivans’ operetta The Mikado (1885) and Sidney Jones’ musical comedy The Geisha (1896) fed this taste for Japonaisserie. In 1885 a “Japanese Native Village” was created in Knightsbridge, London, and the following year a “Japanese village” opened in Prince Alfred Park, Sydney, promising “Male and female artisans, in their native costumes, manufacturing their wares”1. “Here the curious visitor may behold the artist engaged in fan-painting, and the artisan making the fan.”2. JAPANESE FAN ORNAMENTS. Japanese fans are quite important items in decorative furnishing. They are put up singly or in groups. Some folding fans, says a transatlantic contemporary, are used in the place of bows for the middle of loopings in lambrequins or where folds are caught up at one side. There is a very great variety in these fans, the flat ones being in all sizes, from a few inches to three or four feet across, while the folding fans are nearly as large, some of them being used as fire-screens, and having little standards in which the fans are set when spread. There are some exquisite specimens of Japanese embroidery on crepe and silk in fan mounts, especially in the flat fans, where the work is alike on both sides mounted on a hoop or frame. 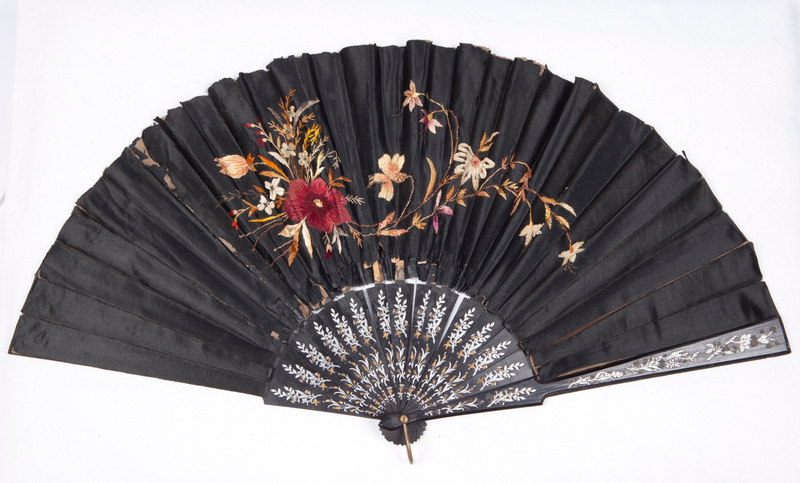 A good many of these fans have been cut up and the embroidered part used in other ways for fancy work, and many ornamental purposes, for which it is especially suitable. The Aesthetic and Arts & Crafts movements favoured the use of oriental objet d’art, and fans from Japan and China were a readily available and especially evocative item. Woven palm fans from South East Asia and the Pacific were also popular, as curiosities and later as travel souvenirs. In Japan fans were produced for export in vast numbers, the Brisbane Telegraph reporting that “no fewer than 3,000,000 fans, valued at £18,000, were shipped from Hiogo and Osaka in 1875.”3 They were generally very inexpensive, meaning that they were readily available accessories for decoration and craft projects. 3. ‘Japanese Fans’ in The Telegraph(Brisbane), Sat 8th Dec., 1877. One homemaker’s journal, The Art Interchange (New York, 1885) provided copious advice for using fans in interior decoration, as well as providing designs for decorating fans and advising where to purchase them - though it also noted that “…the Japanese make no such free use of fans for ornament as we do in our homes.”4. The Japanese have sent hither artists who arrange fans and invent fan shapes for decoration… For instance there are fans large and small and middling in size, and some immense and others minute. There are fans for decoration and fans for use. For the former purpose they come shaped like birds, butterflies, leaves, insects and flowers; fans with openwork decoration, fans of a single colour and fans of many, fans of silver, gold and bronze, luminous and dull, and lastly fans of sober colour… Fans of varying sizes and harmonising colours are now grouped in geometrical forms to decorate ceilings, scattered uniformly over the whole ceiling, or made large and elaborate for a centre piece, or for four corner pieces and centre. Fans are also grouped as friezes, the colours to be governed by the wallpaper, which should show low, flat tones of a single colour allowing play of colour in the frieze. Fire screens may be composed of two huge folding fans for the light to shine through. Drawing room at Rouse Hill House, 1894. Dudley Eugene Batty. Rouse Hill House Collection, Sydney Living Museums. An 1894 view of Edwin Stephen and Bessie Rouse’s then-recently redecorated drawing room at Rouse Hill shows a more unusual choice than the more familiar Japanese fan: a pair of Burmese fans with fixed, translucent panels painted with Hindu figures, fringed in silk, and held on brackets to either side of the ornately swagged chimney glass. 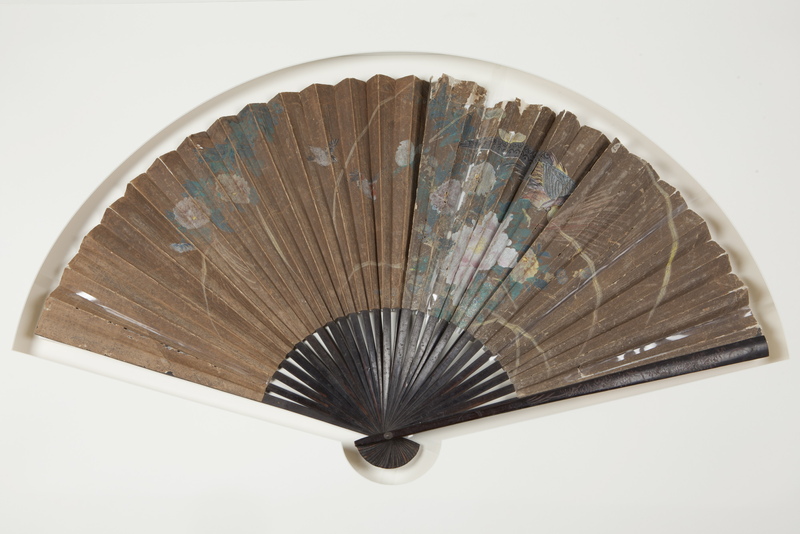 A close study of the photograph also reveals two asymmetrical solid-blade Japanese fans placed on the floor, propped to either side of an oriental box. The sitting room at Percy Lodge, Potts Point, around 1895. Kerry & Co. Hamilton Rouse Hill Trust collection, Sydney Living Museums. The large drawing room at Percy Lodge, Potts Point, around 1895. Kerry & Co. Hamilton Rouse Hill Trust collection, Sydney Living Museums. These c1895 views are of Percy Lodge, Potts Point, which was the home of Edwin Stephen Rouse’s aunt Eleanor Wingate (1813-1898, the seventh child of Richard Rouse) and her husband Major Thomas Wingate (1807-1869). In the drawing room black concertina fans decorated with flowers frame the chimney-glass. In the sitting room concertina fans can also be seen to the side of, and propped behind, the chimney-glasses, along with woven palm-leaf fans. These took the place of the solid-panel hand-screens placed on chimneypieces earlier in the century, and which can be seen at Vaucluse and Elizabeth Bay Houses today. Very large Japanese fans have also been placed to cover the two fire grates. A similar large ornamental fan is in the Rouse Hill collection and was most likely used in that house in the same way. A USE FOR OLD JAPANESE FANS. The Queen [another magazine] hears the very large fans that were in vogue a year or two ago, and even during last summer, if old and discoloured, can be turned to account as washstand splashers, by being spread out to their full extent and fixed, covered with cretonne or sprigged muslin … and fastened against the wall, handle upwards. A large bow is tied around the handle. If no fans are available, and the cheap Japanese ones are unattainable, the shape is cut out in card board and covered. If intended as a gift, the nightdress case, made to match, often accompanies it. 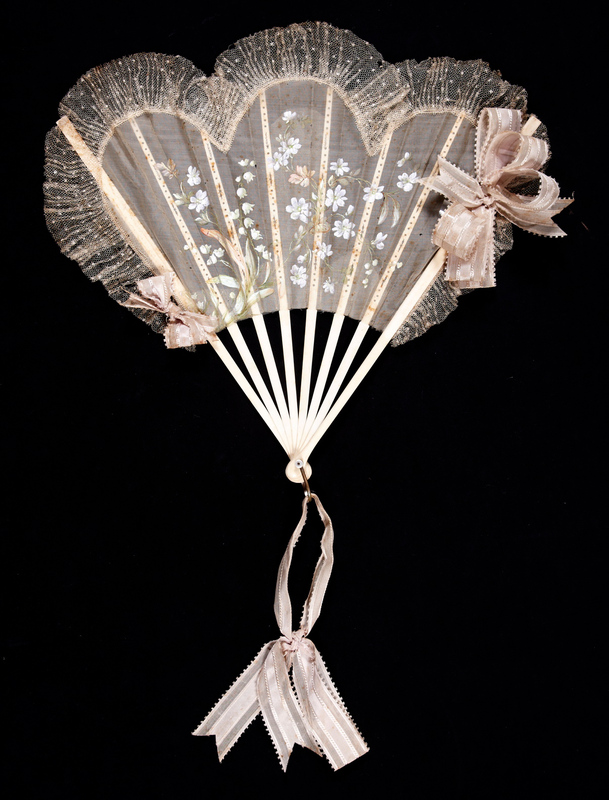 These covered fans are also to be seen in richer materials, in the drawing room, with a bag pocket. A wire is fixed round the edge and the back hidden by paper or cretonne. For most houses the heights of Arts & Crafts design were never contemplated, and ceramics, screens and fans simply joined the cluttered Victorian interiors as curios. As Victorian design was replaced in the early 1900s, they typically vanished just as quickly as they had appeared5. The fans featured in this gallery are of four basic types. The first type of fan, with a simple fixed panel of paper, textile or woven palm is the oldest form and dates back to antiquity. The Burmese fan from Rouse Hill is of this form. 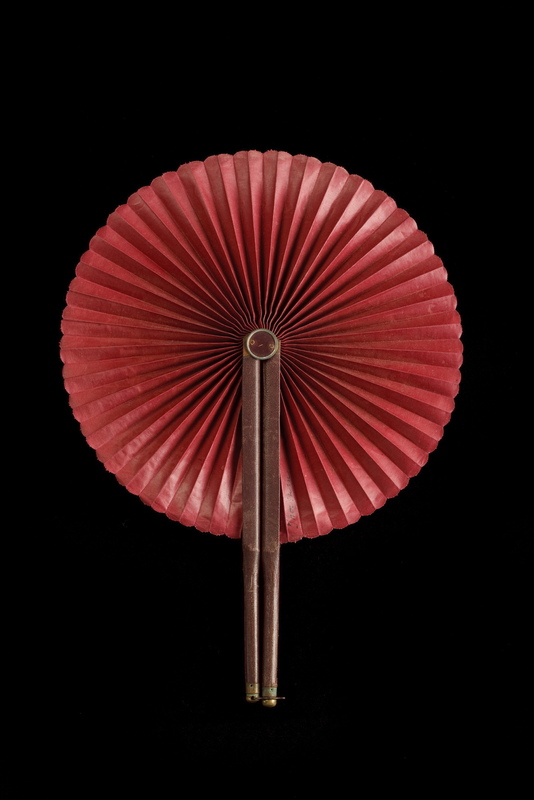 The folding, pleated ‘concertina’ fan, of paper or textile, is perhaps the most familiar and is one of the familiar forms of Chinese and Japanese fans. The concertina fan appeared in Europe in the 1600s. It is often this style of fan that, in costume dramas, gives the satisfying and dramatic ‘thwack’ when opened with a quick flick of the wrist. 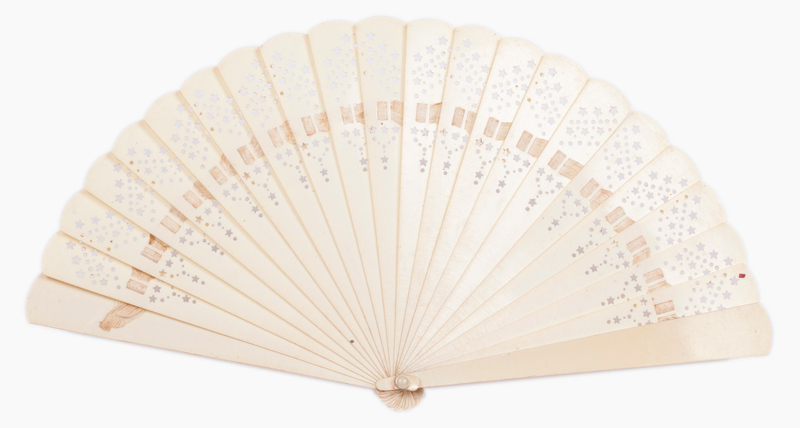 The brisé style of fan has sticks that, linked by tape or cord, slide one over the other when opened. Fragrant sandalwood and ivory brisé fans imported from Canton appear in early colonial trade notices as ‘fancy goods’ and, sold alongside more expensive silk and painted examples, were valued as exotic luxuries. The impressive ostrich feather fans of the Edwardian decades are also of this type. Cockade fans, which have only two outer guards rather than a multitude of inner sticks, and that open to form a full circle, can be pleated or brisé construction. A variation of this type is a fan from Rouse Hill, where a tasselled cord retracts the cloth panel fully or partly into the handle, allowing for a smaller diameter fan to be created if desired. A red cockade fan at Meroogal was a gift to the ladies of that house from ‘George’, their Chinese gardener, after a trip to China. As this selection indicates, the materials used in fan construction were – and indeed remain - diverse: exotic and fragrant woods, paper, silks, woven palm leaves, lace and feathers, ivory, mother of pearl and tortoise shell, mica and celluloid to list only a few. For fan buyers in Sydney these were not necessarily imported – Barracluff’s Ostrich Farm at Dover Heights was a popular destination from 1889 to 1918, and where visitors could apparently choose their feathers ‘direct from the wing’. A concertina dress fan provenanced to Sarah Wentworth (1805 - 1880). Painted paper with mother of pearl sticks. France, circa 1870. 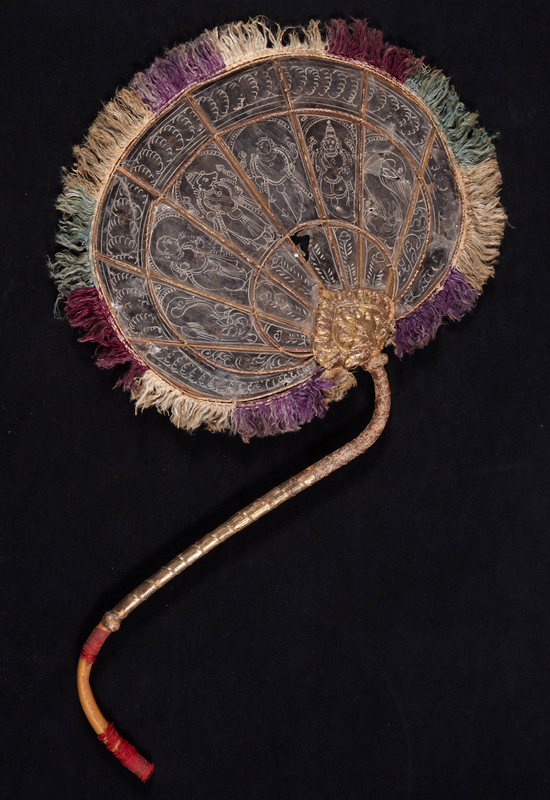 This paper fan has mother of pearl guards and fourteen sticks, with a gilt metal loop handle embossed with scrolling vine leaves. The guards are decorated with flowers, leaves, seated figures of a man and a woman, and a geometric pattern. 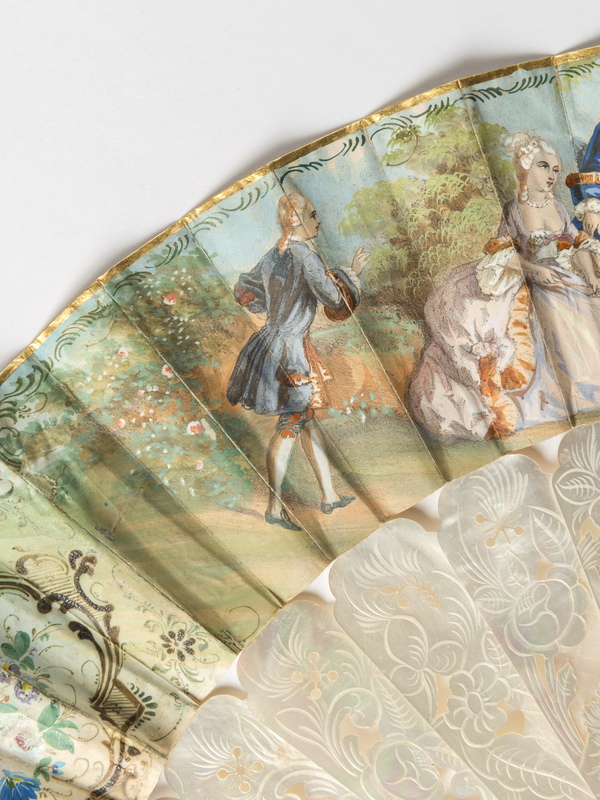 The pleated paper fan is hand-painted with a scene showing figures, dressed in fanciful 18th century 'Aristocratic' costume, in a garden. Few objects so concisely encapsulate Sarah Wentworths rise from the daughter of convicts to the socially beleaguered wife of William Charles Wentworth as this expensive, prized fan. Vaucluse House collection, Sydney Living Museums. Detail of a concertina dress fan provenanced to Sarah Wentworth (1805 - 1880). Painted paper with mother of pearl sticks. France, circa 1870. A very large concertina paper fan. Paper and lacquered wood. Likely latter 19th century. 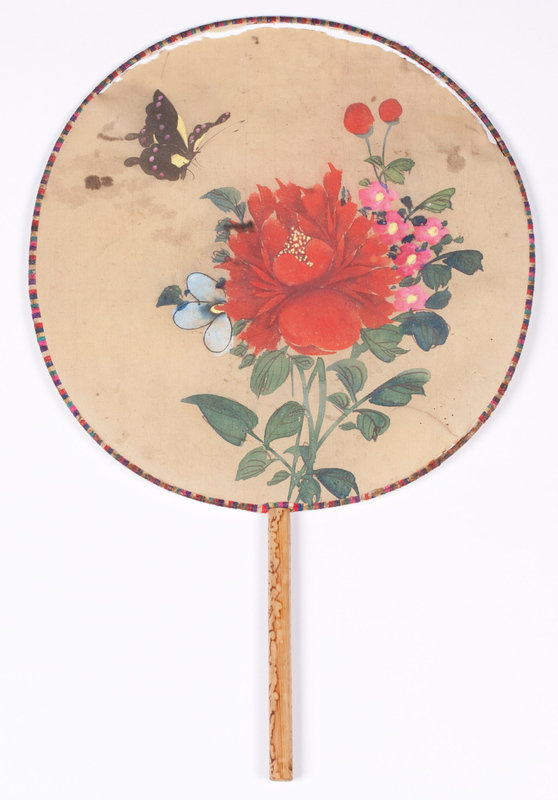 This large fan is decorated with a painted floral and bird motif. Measuring 90 by 65 centimetres, it was likely used as decoration in front of a chimneypiece, as seen in the 1895 view of the sitting room at Percy Lodge (above). Rouse Hill House collection, Sydney Living Museums. Cockade fan. Wood with leatherette and fabric. Likely Chinese, early 1900s. With a handle of dark red leather with silver mounts, this fan extends to form a circle. Pulling the shorter top cord elevates an inner silver square tube and extends a fan of bright crimson cloth. Pulling the bottom red cord, causes the inner tube to go down and decreases the diameter of the fan until fully retracted. Meroogal collection, Sydney Living Museums. 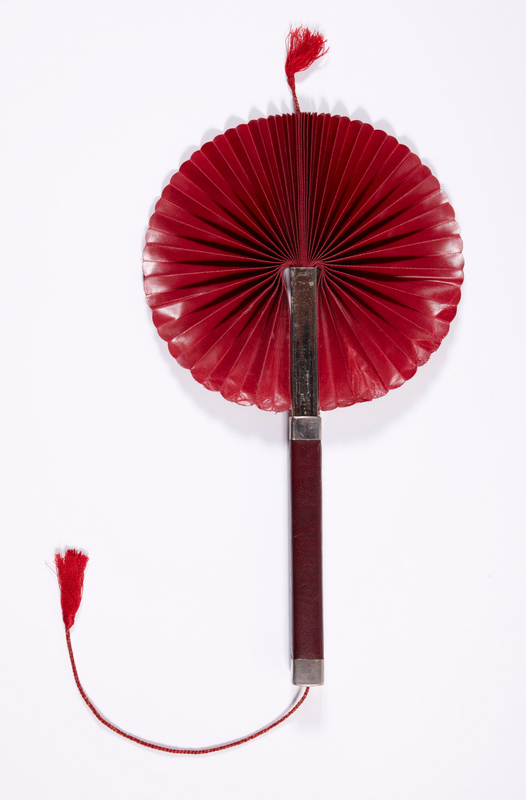 This cockade fan with its vivid maroon fabric was likely a gift to the ladies of Meroogal from George, their Chinese groom and gardener. It was one of several souvenirs he gave them after one of the trips to China he took every five years. The Thorburns admired George and said he was too kind to them. In hot weather this fan became Kate Thorburn’s [1857-1945] favourite and, being very compact, she took it to church in her handbag. It opens with a circular movement, and when closed holds the folded fabric safely between the two wooden sticks. Blade fan with sinuous cane handle. Burma (Myanmar), late 19th century. This exquisite fan, with its sinuous cane handle and a fringed blade, possibly of transparent mica and decorated with Hindu figures, is one of a pair that can be seen flanking the chimney-glass in the 1894 view of Rouse Hill House’s drawing room. Of Burmese origin, they were an exotic contrast to the more familiar Japanese fans, two of which can be also be seen propped against Oriental boxes on the floor. Fixed blade fan of painted silk and bamboo. Likely Japanese, and pre-1939. Concertina fan. Black silk taffeta with floral design. India and China, 1870-1890. Of fashionable black silk taffeta, this fan is decorated with an Autumnal vignette of flowers and leaves hand embroidered in floss silk and chenille to create contrasting textures. Made in India and China it draws on traditional textile and craft skills. 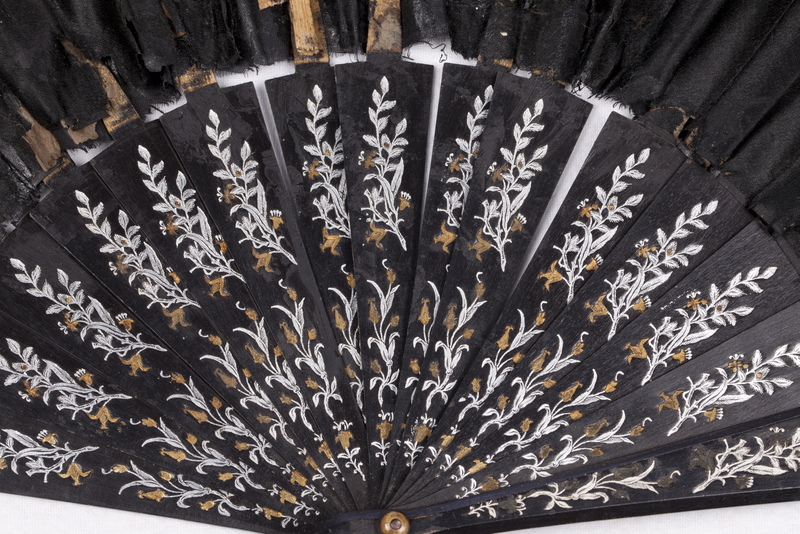 Detail of a black silk taffeta concertini fan, showing the painted sticks. India and China, 1870-1890. This detail of the fan’s sticks shows the elaborate foliate decoration, which simulated gold and silver inlay. This detail of the fan’s sticks shows the elaborate foliate decoration, which simulated gold and silver inlay. Pleated concertina fan. Lace and netting with painted decoration and ivory sticks. Late 19th century. 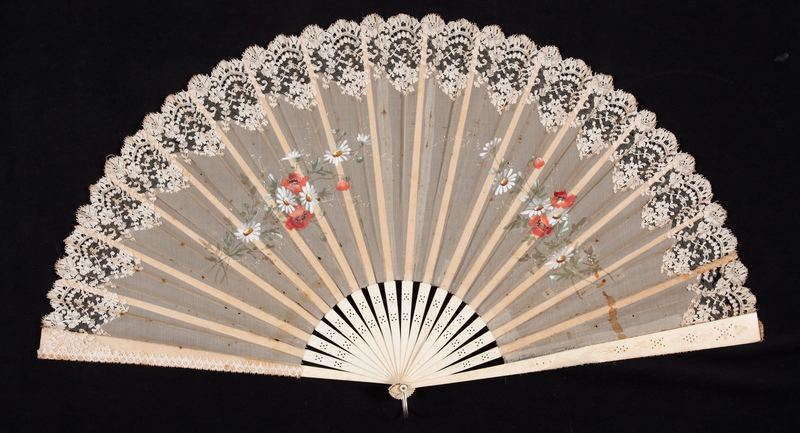 This fan with its ivory sticks and lace trim is decorated with painted vignettes of white daisies and what may be red poppies. The decoration faced outwards to the viewer, the back being quite plain. Pleated concertina fan. Ivory with gauze and lace. Unknown maker, ca1900. Despite its flamboyantly scalloped outline, this fan is still of the basic concertina form. The sticks are of plain and painted ivory, and the blade of delicate gauze and lace decorated with gauze bows. Brisée fan. Ivory Xylonite or celluloid, with pierced decoration, circa 1900. This fan shows the characteristic construction of a brisé fan, where the individual blades are secured by a ribbon and slide over each other to open or close. This example is made from either Xylonite or Celluloid, both of which were used to simulate costly ivory.